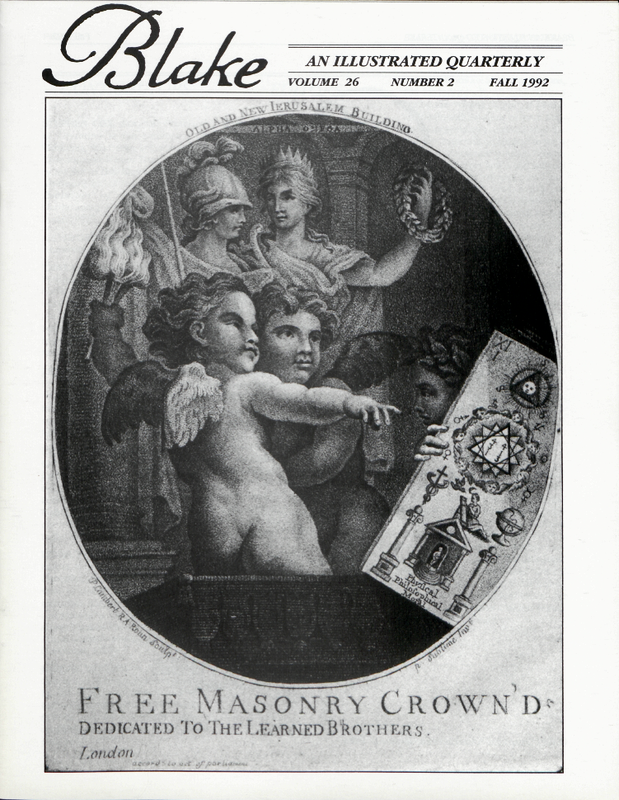 Cover illustration courtesy of the Library Museum of the United Grand Lodge of England. STEPHEN COX, Associate Professor of Literature at the University of California, San Diego, is the author of “The Stranger Within Thee”: Concepts of the Self in Late-Eighteenth-Century Literature, and of Love and Logic: The Evolution of Blake’s Thought (forthcoming, University of Michigan Press, 1992). DAVID GROVES is an Instructor at the University of Saskatchewan. TERENCE ALLAN HOAGWOOD, Professor of English at Texas A&M and currently Fellow of the Interdisciplinary Group for Historical Literary Study, is the author and editor of several books on romanticism, including Byron’s Dialectic, which is forthcoming in 1993. JEFFREY D. PARKER, Assistant Professor of British romanticism at North Carolina ANT State University, has published a few articles on Blake and is currently working on a book on Blake’s commercial designs. MARSHA KEITH SCHUCHARD finds that her medical studies on the history and neurobiology of psychoactive drugs shed much light on the meditation techniques and visionary art of eighteenth-century Illuminés. She is currently completing a Masonic biography of Emanuel Swedenborg. IRENE TAYLER, Professor of Literature at M.I.T., is author of Blake’s Illustrations to the Poems of Gray, as well as essays on the other male romantics and the place of “woman” and women in romanticism. Her most recent book is Holy Ghosts: The Male Muses of Emily and Charlotte Brontë (Columbia, 1990). JOSEPH WITTREICH is Executive Officer and Distinguished Professor of English at the Graduate School and University Center of the City University of New York. He is currently at work on Wars of Truths: Milton and the New Criticisms.